Within the past decade an unusual decline of black walnut has been observed in several western states. Initial symptoms involve a yellowing and thinning of the upper crown, which progresses to include death of progressively larger branches. During the final stages large areas of foliage may rapidly wilt. Trees often are killed within three years after initial symptoms are noted. 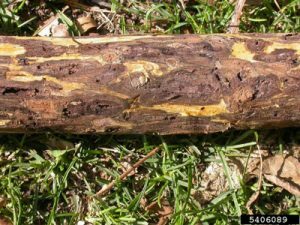 Tree mortality is the result of attack by the walnut twig beetle (Pityophthorus juglandis) and subsequent canker development around beetle galleries caused by a fungal associate (Geosmithia sp.) of the beetle. This disease complex has been named Thousand Cankers Disease (TCD). Yellowing and flagging of leaves on upper branches is usually the first symptom of the disease. This is followed by a progressive dieback that over time causes death of larger limbs and, ultimately, the entire tree. In Colorado, black walnut usually is killed within 3-4 years after initial leaf yellowing symptoms of thousand cankers disease are noted. The production of leaf yellowing/flagging of black walnut can have many other and far less serious causes. However, in areas where the disease is suspected to occur there should be additional examination to determine if thousand cankers disease is the cause. If you suspect you have Thousand Cankers and have ruled out other causes, please contact your local forester or state forest health agency to report the problem and confirm the diagnosis. Thousand cankers disease kills trees by the production of numerous small, dark, dead areas (cankers) under the bark. The presence of cankers is detected by carefully removing the bark from symptomatic limbs. 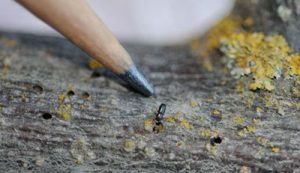 When peeling the bark to visualize cankers, be sure to not cut too deeply; the beetle galleries and fungus originally are found in the living bark (cork cambium) and not the wood cambium. Individual cankers may originally be only a few millimeters in diameter, but ultimately can be 3 cm or greater and often assume an elongate oval form. Typically the appearance of a shallow tunnel produced by the walnut twig beetle will be present near the center of the canker. The combination of a dark canker with the beetle tunneling is almost certain confirmation of thousand canker disease. However, dark cankers occur under the bark following wounding and other injuries. Culturing the Geosmithia fungus from the canker will allow positive confirmation of thousand cankers. Very little is known about sanitation and control but research is continuing. If trees have the disease they should not be moved out of the area for at least three years. Full and complete debarking is believed to eliminate the beetle but that has not been 100% confirmed. Chipping of the bark does not eliminate the beetle. Fumigation or heat treating may be effective controls but tests are in process to confirm. To minimize the spread of this and a variety of other diseases firewood should never be moved. Thousand cankers, a newly recognized and devastating disease that attacks black walnut trees, has killed a large number of trees across the western states and has now moved eastward into several communities along Colorado's Front Range, including Boulder and Colorado Springs and the Denver area. 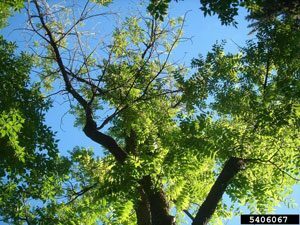 Black walnut trees in Denver are facing a very serious new threat called thousand cankers disease. This recently recognized problem has already devastated black walnut trees in Colorado Springs and Boulder and is believed to have been active in Denver for at least three years.